Starring: Daniel Day-Lewis, Winona Ryder, Joan Allen, Paul Scofield, Bruce Davison, Jeffrey Jones, Rob Campbell. Who better to pen the script to a film version of the classic stage play, than the playwright himself, Arthur Miller? 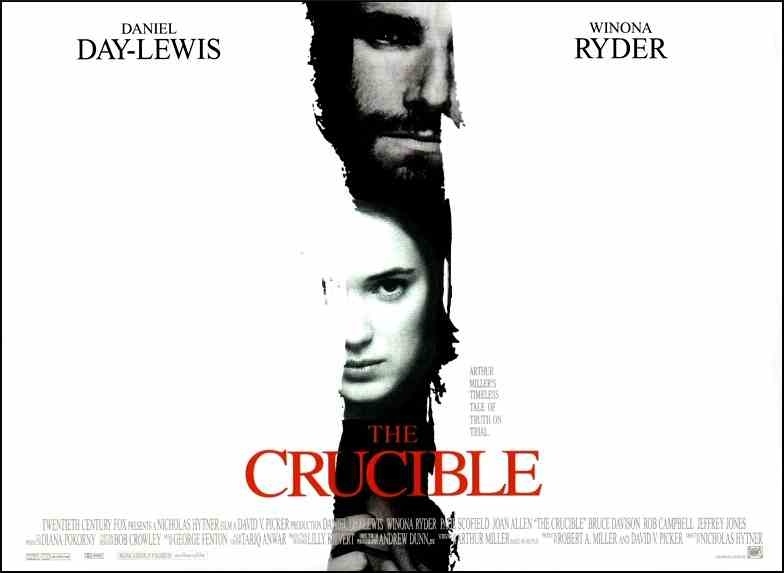 Centered around the Salem Massachusetts witch trials of 1692, it tells the story of Abigail Williams (Winona Ryder), a young woman who is infatuated with local landowner John Proctor (Daniel Day-Lewis). They once had an illicit affair but when Proctor refuses any further contact, the jilted Abigail accuses Proctor’s wife Elizabeth (Joan Allen) of witchcraft, resulting in trials being held. Young Abigail is so convincing in her scornful lies, that it brings the whole town to ruin and under suspicion. With the arrival of Judge Danforth (Paul Scofield), determined to rid the town of evil forces, hangings of innocent people begin, prompting Proctor to face the lies he has told in order to save his friends and his wife. Although loosely based on actual events it was also written by Miller as an allegory on Senator Joseph McCarthy and his “Communist witch hunts” of the 1950’s, that blacklisted artists and filmmakers for being “Un-American”. This included Miller’s one time friend and film director Elia Kazan, who went on to make “On the Waterfront” as a defence of his ‘naming names’ and a direct response to Miller’s play. It’s a powerful film with powerful performances. Not being overly keen on Winona Ryder, she is actually really good as the conniving and scorned Abigail. Joan Allen is absolutely solid as the seemingly stoic and reserved wife. Daniel Day-Lewis’ tormented Proctor is at first, slow-burning but once he realises the full extent of the injustices, his portrayal of a proud man torn apart by guilt is mesmerising, and the almost expressionless Paul Scofield seems to convey his character through his tone of voice, which is very powerful and, quite simply, a masterclass in acting. It would make an interesting double bill with Kazan’s “On the Waterfront“. Both having entirely opposing messages and themes throughout and showing, quite clearly, what side of the fence they both sat on. Me?… I’m with Miller. This entry was posted on January 28, 2012 at 4:01 pm and is filed under Drama with tags 1996. You can follow any responses to this entry through the RSS 2.0 feed. You can leave a response, or trackback from your own site. Great review, I need to watch this as I haven’t seen it yet. Thanks for the reccomendation. Cheers man. Yeah, I found the history behind it all quite intriguing. Miller was passionate about McCarthyism and this was the result of his hatred for it. As I mention, it would a good double bill with On The Waterfront to the opposite views from Miller and Elia Kazan.